These D.I.Y cut-off shorts came in handy for the Roots Picnic. My sister actually got the jeans from a local thrift store. She knew it had the potential to become cut-off shorts. I decided to take it a step further and make it distressed. Because I'm still very much into distressed/ripped jeans. It was fairly easy to create. I made a mark on the jeans where it needed to be cut, used a razor blade to distress the jeans in various of places (and this was made simple because I cut along the whiskers path; I don't like whiskers on jeans...too played out), removed the corny sequin butterfly patch, tossed it into the dryer and...here we are. 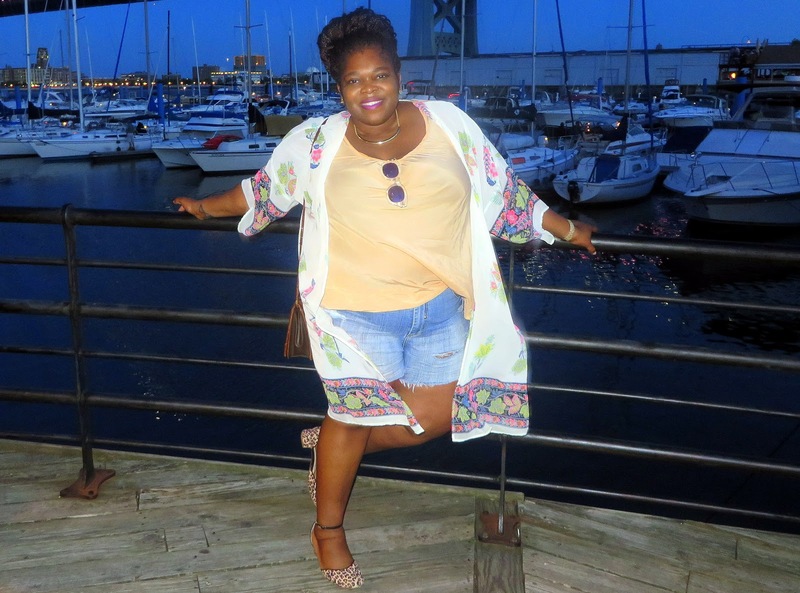 Styled the cut-off jeans with a floral kimono from Charlotte Russe, H&M tunic, and for a fun clash of patterns, wore Simply Be ankle strap low heels in animal print.